Welcome back to “Beer of the Week”! This review of Rowers was written by NHC member Tube. Visit the members-only “Beer Reviews“ section to submit your own review. 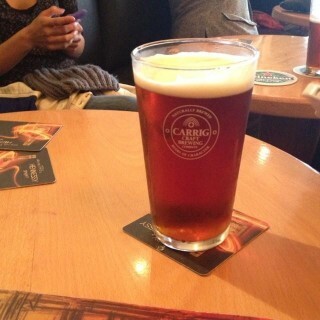 While recently on a visit to Carrick-on-Shannon, I had the opportunity to once again sample some Rowers Red Ale. This is one of a number of beers which is owned and marketed by Carrig Craft Brewing, who claim the word Carrig is ostensibly linked with the name of the town from which it hails. However in this case of this Co. Leitrim town, Carrick is actually derived from ‘cora’, the Irish word for weir, as opposed to ‘carraig’, the Irish word for rock. Not that it really matters, as it’s a catchy name and in any case the beer is actually brewed by Bo Bristle in Banagher, Co. Offaly. Bo Bristle was formerly known as Breweyed, where gently spoken Englishman Andrew Horn is the brew master, operating on a PBC Brewery Installations 1,000L system. While the tap badge does not mention the word Red, it is used in the marketing, leading me to assume that this was an Irish Red Ale, of the Smithwicks sort. However, I was pleasantly surprised to find that unlike the latter, Rowers has quite a body, and also unlike the latter, moderate carbonation, of which I would estimate at 2 to 2.2 volumes. The head is quite thick, and even though the Carrig-branded glass was nucleated, the nucleation was not necessary as if anything it encouraged the head to grow. Looking at how dense it is, this is probably a wheat derived head. The beer however is perfectly clear, and Bo Bristle’s website does mention filtration so that could be the reason. The beer itself tastes nothing like an Irish Red, which would typically derive its colour and a lot of flavour from roasted grains. While Rowers probably has some, possibly more for colour, it has more caramel type flavours that one would normally associate with an English mild or bitter. There is a decent hop bite too, again English style hops come to the fore and I would guess Challenger or Target, but I suspect there is a dash of American hops in there too. Pint goes down really well, and is ideally accompanied by another one! There is again excellent lacing on the glass, which I’m putting down to wheat malt. At €4.50 a pint this is really quite a good beer and I would recommend anyone to try it.